‘Fresh water’ is a dominant theme in the story of Frenchman Bay. Vancouver Spring has supplied water to various types of shipping in the Albany area for nearly 200 years. The water supply from Vancouver Spring played an important in the development of Albany as it was the only reliable supply to the town in the early 1900s. Captain George Vancouver was the first European to record the springs located above the western section of Whalers Beach at Frenchman Bay, in September 1791. He used the spring water to refill the on-board water supplies for his two sailing ships – HMS Discovery and HMS Chatham. French naturalist Francois Peron wrote that having read Vancouver’s journal he was aware of the spring when he and Freycinet, members of Baudin’s 1803 expedition, reached Frenchman Bay in the nick of time having almost completely exhausted their water supplies. Of course, the awareness that there was a year-round supply of fresh water at the place Europeans later named ‘Whalers Beach’ would have been known to Noongars for Millennia. Because of Vancouver’s visit, and the publication of the journal of his visit, the spring became a well-known and popular water supply location; used extensively from 1820 to 1860 by international and Australian sailing ships. During this time, a wooden trough was constructed across the beach to facilitate water loading. “After Vancouver’s visit the Sound became a safe haven for local and international shipping. It is likely during this time, Whalers Beach, with streams that flow all year round and a sheltered anchorage would have gained favour as a place to replenish water supplies” and was “……used by sixty whaling ships of different nationalities”. There was no safe anchorage in the proximity of the Swan River Colony settlement andAlbany became the port for the Colony of Western Australia. As the settlement of Albany grew in size, and demand for fresh water grew in tandem. It needed a reliable water source. 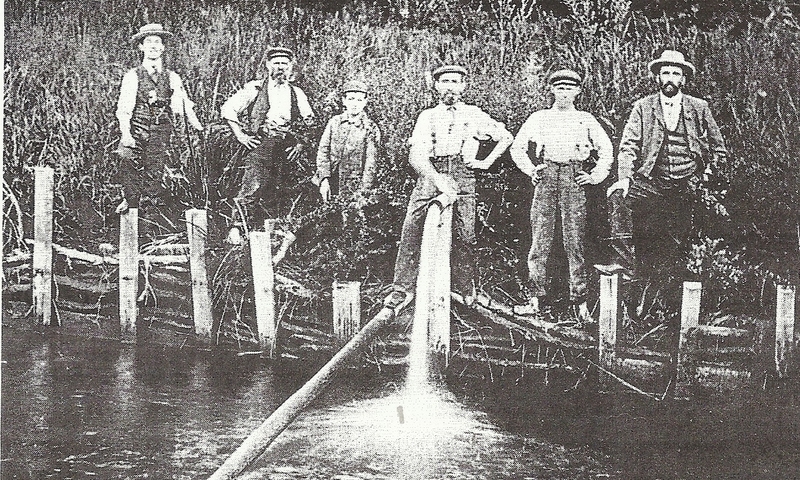 The first version of Vancouver Dam is thought to have been constructed in 1851 coinciding with the arrival of the first steamers. The Peninsular & Orient Company (P & O) had won the sea-mail contract across southern Australia. The company operated a fleet of steam-sailing ships that relied on pure water for the ships’ boilers. Water with mineral contaminants would corrode the boilers. In order to supply the water requirements of their fleet, P & O built a dam above Vancouver Spring to form a reservoir with a reliable and sustainable supply. Lighters would fill up with fresh water and convey it to the steamers anchored in the Sound. From about 1890 to 1902, Albany was sometimes unable to meet shipping demands for water. 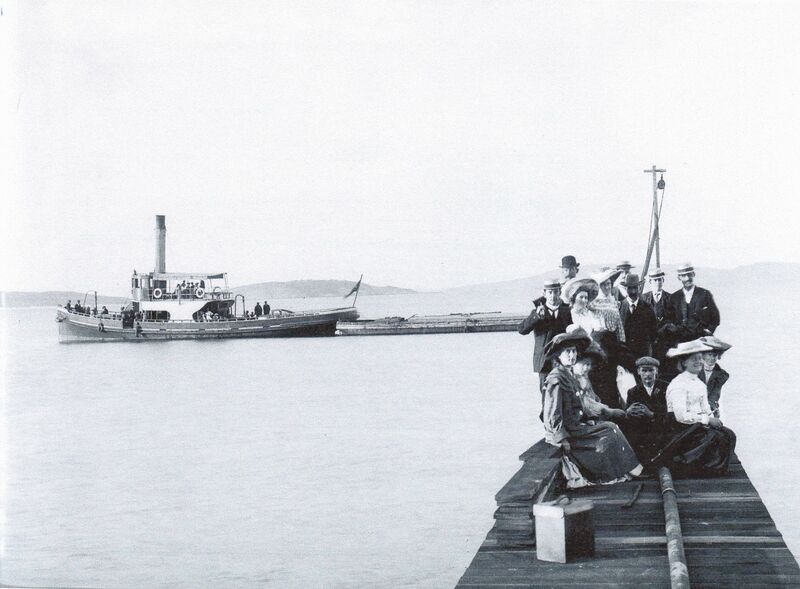 As a result, in 1902 Armstrong and Sons upgraded the construction of Vancouver Dam (to more or less its present configuration) and constructed a jetty at the beach. The jetty and the pipeline carrying the fresh water are shown in the photo below. Also visible is a ferry carrying the picnickers posing on the jetty. A lighter used to transport the water is also visible. Mr. Armstrong was the Mayor of Albany and had a contract to supply water from Vancouver Dam to the Town of Albany and various types of shipping (including Boer War transports) until about 1912. By 1914, Albany’s water supply had improved and the Frenchman Bay supply was only occasionally required. From 1912 to 1915, the Norwegian-owned Spermacet Whaling Company operated a whaling station at Whalers Beach and used Vancouver Dam for both a potable and process water supply – by installing a pipeline along the beach from the dam to various areas of the whaling station. Both the spring and the dam occur within the heritage-listed precinct of the Norwegian Whaling Station at Whalers Beach. From the 1920s to the 1980s, various tearooms; chalets; and caravan parks were established above Whalers Beach and used the Vancouver Dam reservoir as a water supply – until a bore was drilled above the beach in the late 1980s. Even when the mains water supply from Albany reached the Goode Beach area in 1983, people still collected water from Vancouver Spring for various domestic purposes (including tea making), because of the good taste of the water compared to the scheme water!